Intake Hours: Intake for UGM Calvert Place men's shelter happens every day from 3:00-5:00 p.m. at The Bridge at 1818 Corsicana Street in downtown Dallas. All registered clients are bussed to the Calvert Place Men’s Shelter and returned to The Bridge the following morning. The Mission Calvert Place services two types of men: Clients and Disciples Clients come to the Mission at night for meals, showers, clothing, Chapel and shelter. Disciples are Christians who sincerly wish to change bad habits that contributed to their homelessness. These Disciples live at the mission full time and help in maintaining the facilities. For more information contact Union Gospel Mission or visit the Union Gospel Mission website. UGM's Calvert Place Men's Shelter serves adult homeless men age 18+, offering meals, bed, clothing, showers, health clinic and daily chapel service to as many as 335 homeless men. Clients are bused to UGM Calvert Place from The Bridge (the city's homeless service provider) during the late afternoon and bused back in the morning. The men's facility has secure lockers, where clients are allowed to store some of their possessions. When a client goes through intake, he is assigned a particular bed. That same bed is his for as long as he stays at the shelter. Be a volunteer. 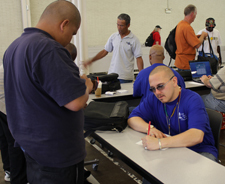 Call Union Gospel Mission - Calvert Place For Men Shelter at 214-637-6117 for current volunteer work opportunities. Posting Comments below is for viewers on this website only. If you have information that can help users regarding Union Gospel Mission - Calvert Place For Men Shelter, please provide it below.